In politics, you have to generalize a bit in order to create voter universes, right? Who to target, how to target, and how to drive voter turnout—those are pretty much the basics for a grassroots operation in an election year. For Democrats, they think young people and people of color can clinch them big wins this cycle. There’s only one problem: these people don’t really vote. In deep blue California, NBC News failed to find really motivated and politically active voters at UC Irvine. These students know they should vote but were more than willing to say on camera to Democrats that they shouldn’t rely on them to vote this year. For Latino voters, Democrats think they can mobilize them big league due to President Trump’s common sense immigration, which some (pansies) view as hardline, but that hasn’t been the case. Is there anger? Yes, but NBC News also found that there’s not much motivation to get to the polls. Donald Trump stares at Mary Morales every day from across her office at the Texas Organizing Project, a group working to turn out black and Latino voters in a state ranked almost dead last in voter participation. Morales was looking forward to smashing the child-sized Trump pinata at the end of the 2016 campaign — but then Trump won and spoiled her plans. So there he stands, fully intact, a silent reminder to her and the dozens of paid canvassers who are dispatched from here every day to do the sweaty, grinding work of going door-to-door to cajole people to get out and vote on Nov. 6. "People are angry, but it doesn't necessarily make them want to vote," said Morales. "They're like, Why even bother voting if people like Trump are going to win?" Nationally, Latino voters favor a Democratic Congress over a Republican one by 64-21 percent, according to an NBC News/Wall Street Journal Telemundo poll last month. But self-reported interest in the election is low, according to the same survey, and the picture in some individual races looks even worse for Democrats. On paper, some of congressional Democrats' best opportunities to pick up seats come from heavily Hispanic districts that are currently held by Republicans, but which Hillary Clinton won in 2016. Yet those are also some of the places where recent polls are showing Democratic candidates not doing as well as anticipated. In Miami, Democrats risk blowing what was once seen as a sure-thing after they nominated former Bill Clinton Cabinet secretary Donna Shalala, who doesn't speak Spanish. Next door, GOP Rep. Carlos Curbelo is neck-and-neck with a Democratic challenger in a 70 percent Latino district that Clinton won by 16 percentage points. In Nevada, incumbent Republican Sen. Dean Heller has been able to cling to a narrow lead by keeping a healthy 38 percent of Latino voters in his camp, according to a recent NBC News/Marist poll. And in the Las Vegas suburbs, handicappers just downgraded Democrats' prospects of holding onto the majority non-white 4th Congressional District. Not far away in California, where Democrats are well-positioned to overcome 80 years of Republican dominance in the wealthy suburbs of Orange County, two GOP incumbents, Reps. Jeff Denham and David Valadao, look relatively strong in heavily Hispanic parts of the Central Valley. And in Arizona, Democrat David Garcia's campaign to become the state’s first Latino governor has struggled to gain traction, even though Clinton came closer to winning that state in 2016 than any Democrat in years. 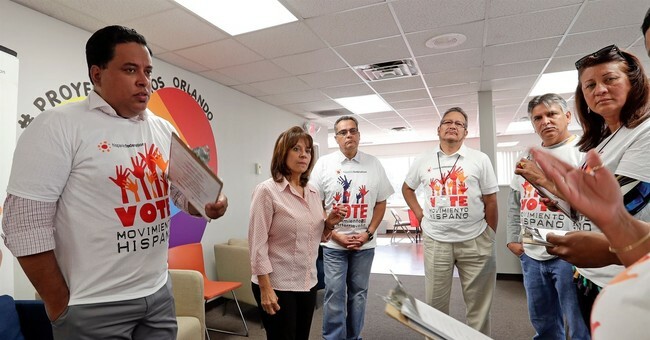 Democrats and activists working to turn out Latino voters say they face several obstacles, some of them created by the party itself. And they worry that anger toward Trump, rather than driving votes, is turning people off of politics altogether. "The more noise there is in Washington, D.C., oftentimes it can be confusing and it can be intimidating to voters," said Dan Sena, who is overseeing an estimated $30 million outreach effort to young and minority voters as executive director of the Democratic Congressional Campaign Committee. Oh, and Ted Cruz (R-TX) has a solid 40 percent of Latino support in his re-election bid against Democrat Beto O’Rourke. The lengthy piece added that the Hispanic voter bloc trends younger, which puts a pinch on the Left: devote more resources to getting these young voters engaged which sacrifices time and energy spent on Democrats who are actually going to show up and vote this year. With less than 30 days from Election Day, I doubt Democrats have time to correct this issue. We’re entering the phase for both sides, where it’s all about mobilizing and reminding the people in their voter universes that they know will show up on November 6.